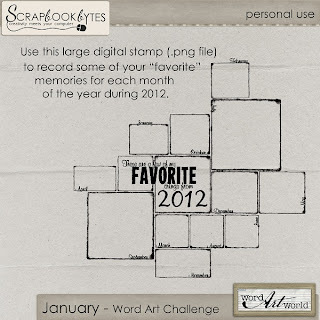 Word Art World: Free Digital "Favorite Things of 2012" Stamp! 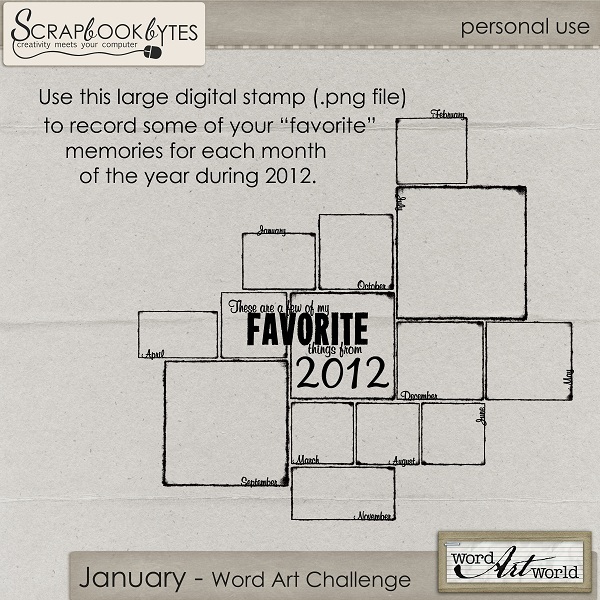 Free Digital "Favorite Things of 2012" Stamp! I don't know how you feel, but this year just flew by for me! I cannot believe 2013 is here already. I love to go back and look at the pictures I took to see all of the fun things we did as a family. So, the challenge for is to find ONE picture for each month of 2012 that stands out to you. Then, use this digital stamp (.png file) to showcase those twelve photos. Feel free to use the stamp in any way you'd like. You could even use the blocks to journal in. I cannot wait to see what you come up with! Word Art Challenge thread at Scrapbook-Bytes.